× 2 = twelve Required Please enter the correct value. A group of 35 analysts surveyed by Thomson/First Call have an average price target of $106.9 for Alibaba Group Holding Ltd. (NYSE: BABA) stock. That represents a gain of almost 32% from today's opening price of $81.17. 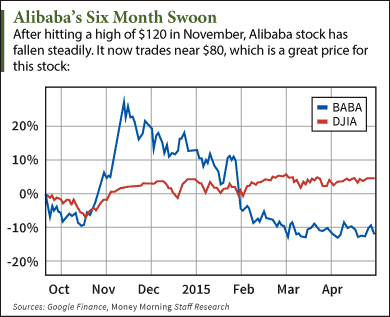 But our Alibaba stock price prediction sees BABA climbing much higher than that in the long term. In fact, Money Morning's Defense and Tech Specialist Michael A. Robinson says Alibaba "could be the single-greatest wealth opportunity of our lifetime." BABA stock has dipped 22% in 2015 and was trading below $81 per share early Monday. But despite its drop, Alibaba shares are one of the best long-term buys on the market. The first major catalyst for Alibaba stock is the growing Chinese e-commerce industry. In 2013, online shopping in China was a $298 billion industry. That surpassed the United States as the largest e-commerce market in the world. New research from AT Kearny estimates Chinese e-commerce will total $718 billion by 2017. A recent study by the China Internet Network Information Center (CNNIC) determined the number of Internet users in the country will hit 800 million by 2016 or sooner. By comparison, the entire current population of the United States is just 319 million. "Alibaba is gaining traction in its home market in China just as that country's people are truly joining the Internet revolution," Robinson said. "And the development of easy-to-use mobile commerce is giving Alibaba a strong tailwind." That mobile development is Alibaba's second catalyst. Alibaba has invested heavily in its mobile development. In February, it spent $590 million on a minority stake in the Chinese smartphone maker Meizu. Before that, Alibaba spent $1.9 billion on the mobile web developer UCWeb. It also dropped $215 million for a minority stake in the messaging app Tango.